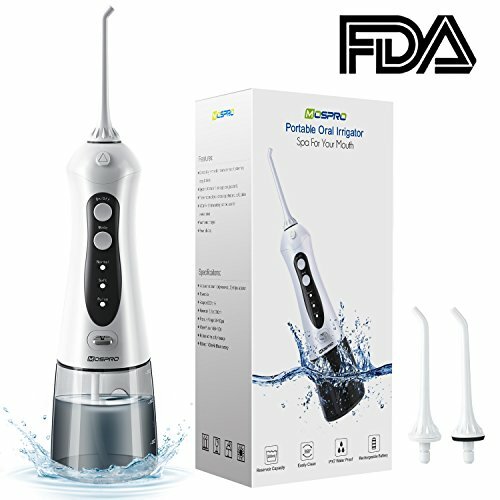 Water flosser supports 3 operation modes (Normal, Gentle, Pulse), delivering a water pressure of 30 to 100 psi, and you can choose your best pressure setting.? Water frequency up to 1800 times/minute, quickly clean up food debris and bacteria hiding in your teeth, gum and fissure. Fills up to 200ml of water from two ports. Avoid the hassle of having to frequently refill the water while flossing. If you are using this dental flosser for the first time, please choose the gentle mode; and once you are adapted to it, you may use other modes as you like. Please charge the water flosser in time when you notice the water pressure becoming low. (For example, if you use it twice a day, you should charge it once a week, depending on the frequency of use). This oral irrigator can be washed directly with water, but taking the service life into account, please do not soak it in water for a long time and keep it dry after each cleaning. If you have any questions about this product by MOSPRO, contact us by completing and submitting the form below. If you are looking for a specif part number, please include it with your message.